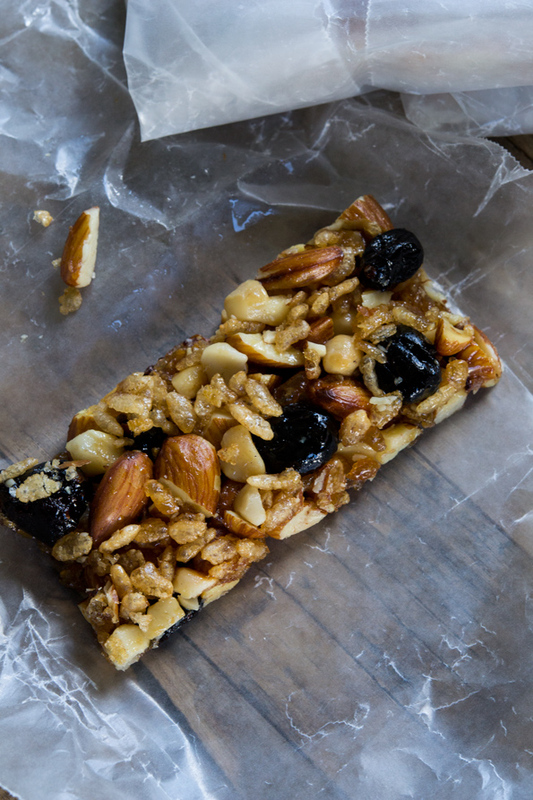 Cranberry Almond KIND Bars | Great gluten free recipes for every occasion. I actually really love it when I get requests like that, since, well, it’s easier than trying to read your minds. And sometimes, I can even oblige. One good turn deserves another, right? Today, I give you Cranberry Almond KIND Bars. Think of all the money you’ll save! Believe it or not, it took 3 tries to get these KIND Bars just right. So I really don’t recommend altering the recipe, at least not at first. Sometimes, it’s the simplest recipes that can kick you swiftly in the … rear. One step too far this way, and you’ve got bars that just don’t hold together. A step too far that way, and well they just don’t look or taste like KIND Bars. I’ve offered up one sub in the recipe itself (more honey instead of Lyle’s Golden Syrup), but otherwise, step away from the red pen! When I do copycat recipes, I begin with the ingredient list on the package. But since we’re in our home kitchens and not in a laboratory or a manufacturing plant, it usually takes some finessing. In a good way, you know? It’s good to have finesse. And style. And a good pair of jeans. My major innovation with this KIND Bar recipe? Grinding about 1/4 of the almonds in the recipe (eyeball it). It really helps to hold the bars together, so they’re not just a jumble of big pieces of nuts and dried fruit. Since they don’t tend to look as pretty on top, though, that way, but they’re still gorgeous and look just like the real thing on the underside. So … when you turn them out of the pan, just flip them over. I love it when the solution is staring you right in the face. Preheat your oven to 300°F. Line a quarter sheet pan (a shallow rimmed 9 x 13-inch baking sheet) with unbleached parchment paper and set it aside. In a blender or food processor, place about 1/4 of the whole almonds and grind into a mostly fine powder. In a large bowl, place the ground almonds, the remaining whole almonds, macadamia nut pieces, rice cereal, cranberries and salt, and mix to combine well. Add the oil, and toss to coat. Add the honey and Lyle’s Golden Syrup and mix to combine well. The mixture will be very thick and sticky. Scrape it into the prepared pan and spread into an even layer. Cover with another sheet of unbleached parchment paper, place another quarter sheet pan on top and press down evenly with as much force as you can muster to compress the mixture into an even layer. Be careful not to allow large clusters of almonds to gather in the corners of the baking sheet, or they will not hold together when you slice the whole thing into bars. Remove the top baking sheet and top sheet of parchment, and place the baking sheet in the center of the preheated oven. Bake until the mixture is lightly browned and bubbling (about 20 minutes). Remove from the oven and allow to cool for about 10 minutes. Without removing the bars from the baking sheet and using a bench scraper or butter knife, score the bars into 3 equal rows of 5 rectangles each. Allow the bars to cool for another 10 minutes before placing in the refrigerator until completely chilled (about 30 minutes). Remove the bars from the refrigerator and invert the bars onto a cutting board, with the parchment paper now on top. 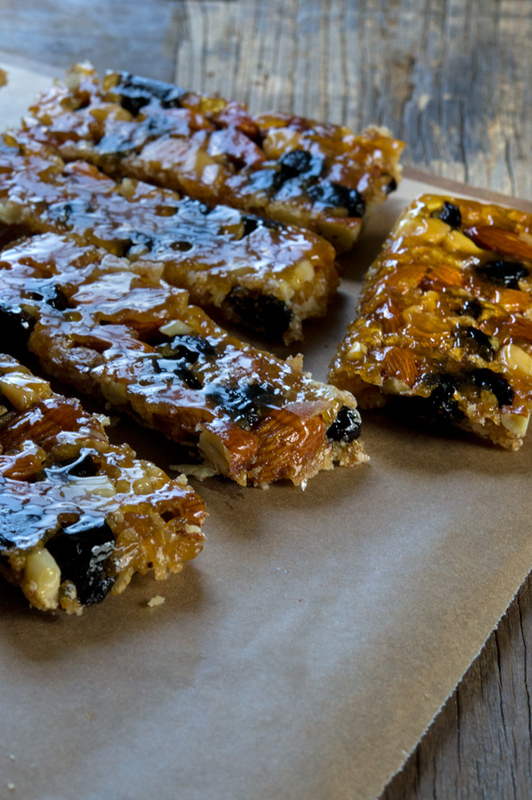 Peel off the parchment paper, and finish cutting 15 bars. 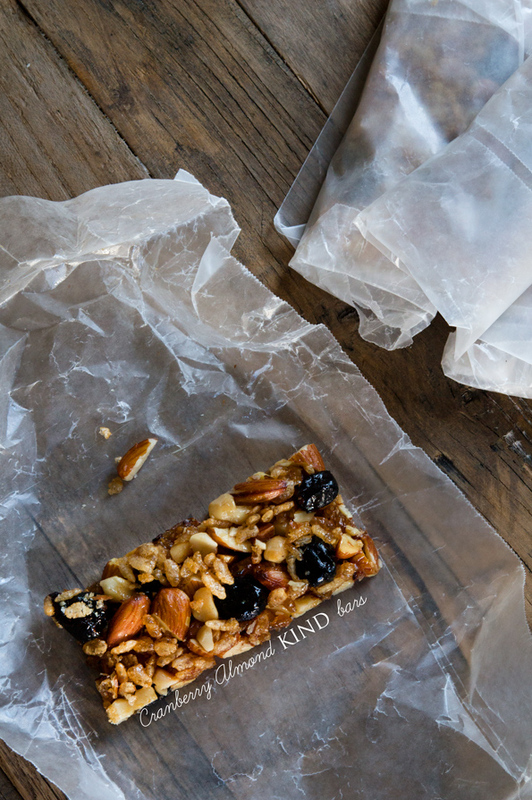 Wrap each bar tightly in wax paper, and store in the refrigerator or freezer. Stumbling Over Chaos :: Does linkity really even need a title? I always use coconut in place of canola. Obviously it only works if you don’t mind a little coconut flavor (which we don’t). Or you can use grapeseed oil. Are these considered paleo or is the honey too much sugar. I think they allow honey. Hoo Whee! I made these tonite and there are 13 of them in the freezer. My son asked me to hide them! I had to do some subbing as I had the ingredients just not enough of each so… I used a combination of chopped walnuts, macadamia nuts and almonds, gogi berries,sunflower seeds. I used almond flour instead of instead of grinding some of the almonds. I did have enough cranberries so that stayed the same. I didn’t have the same kind of cereal so I used cinnamon rice cheks instead and all honey. I did end up using about a cup of almond flour and a bit more honey. So they were the same only different!! and awesome! Delicious! Wonderful! and I thank you so much for the recipe. I will make these again and hopefully I will have the correct cereal on hand, if not…I know that it is a very forgiving recipe. Do you think these are healthy? Gah! Thank you for this! Your recipes are the best. I have a KIND bar most mornings for breakfast, but they are spendy. Plus with this recipe, I think I could safely figure out how to make my other favorites – Almond and Apricot and Almond and Coconut. LOVE the Kind bars too! So expensive so I only buy when on sale and I’m sure making them will be less expensive! Thank you so much! I’m wondering if I can use Agave syrup instead of honey as I need low glycemic sugars. I love that macadamia nuts are in these too! I’m going to try these very soon. As I say in the post, Marilyn, I really don’t recommend making these with any substitutions, as it’s such a simple recipe and was not easy to get just right. Sorry! Agave is actually not very low glycemic. Raw blue agave is better than some things but still pretty high. Raw honey is lower than standard processed honey. KIND bars are very sweet, so if these are designed as a copycat I’m assuming they’re pretty sweet too? If you’re needing to watch your sugar intake you may be better off with a recipe that doesn’t require so much sugar. Sorry :-( I’m in the same boat!! OMG — this look wonderful! But I am allergic to almonds. Do you suppose I could use a different nut or even pumpkin seeds? Please let me know as I wouild love to try these!! Thanks!!! As I said in the post, Sandy, I don’t recommend making these with any substitutions as it’s a very simple recipe. 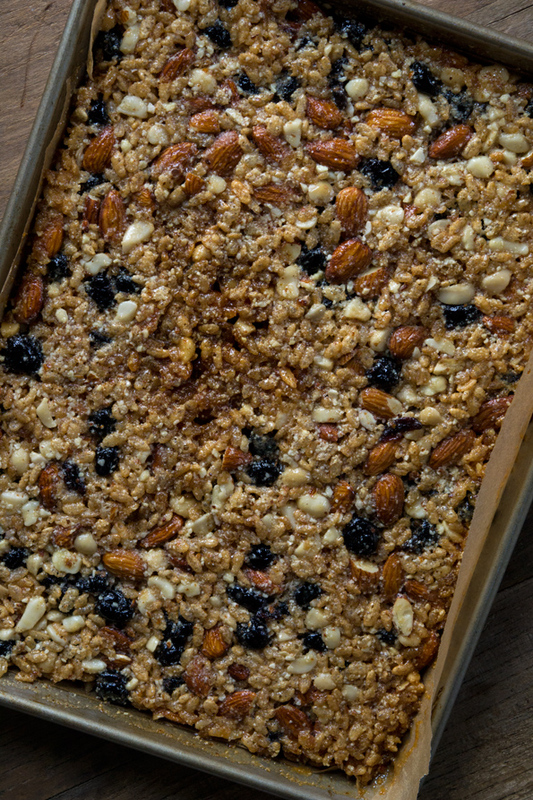 I think you’re better off with another granola bar recipe – I have other on the site that are more versatile. Sorry! Well I am the smarty pants person who requested this and I am doing major happy dancing right now! You even made my favorite one first! If I could, Nicole, I would kiss your feet! Call me out whenever you want. I can’t believe how quickly you accomplished this from the time of the request! Perfect timing! I had my first Kind bar last week and was thinking I should just make them myself considering the price – thanks for making it even easier, Nicole! You must have a secret crystal ball! OMG! You just made my day! I LOVE these bars! I see a trip to the grocery for ingredients in the near future! BTW – I love that you are starting to investigate the heartier (less starchy) GF options and paleo! Thanks for the encouragement, Alicia! I think it’s good to experiment. Each of these diets and lifestyles, I think, has something to teach! Okay, okay, I won’t alter the recipe and put mini chocolate chips in these. Yet. I’d love to see a “Make it vs. buy it” comparison on these! we love these bars!! thank you for another quick breakfast recipe! !